It’s not always easy to impress kids, but apparently $1 million worth of lights does the job. 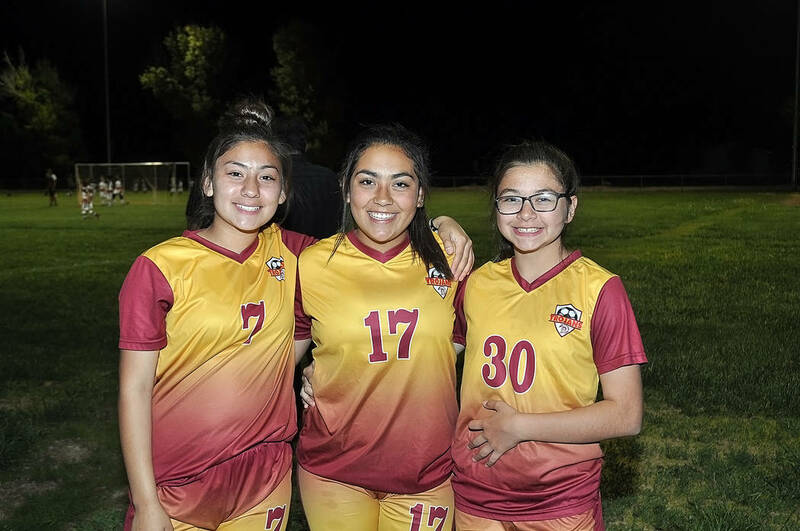 Horace Langford/Pahrump Valley Times Andrea Sauceda, 13, Haven Nelson, 13, and Alexis Martinez, 12, take a break from soccer practice under the lights Monday night at Simkins Park. 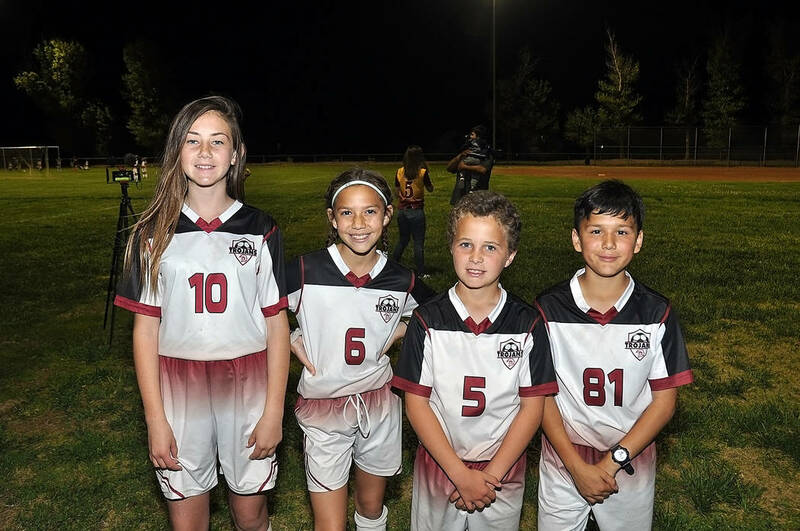 Horace Langford Jr./Pahrump Valley Times Pahrump Junior Trojans Soccer Club players, from left, Kylie Crotty, 11, Emily Mendoza, 10, Kohlzin Park, 10, and Benjamin DeSantiago, 10, at Simkins Park on Monday night. 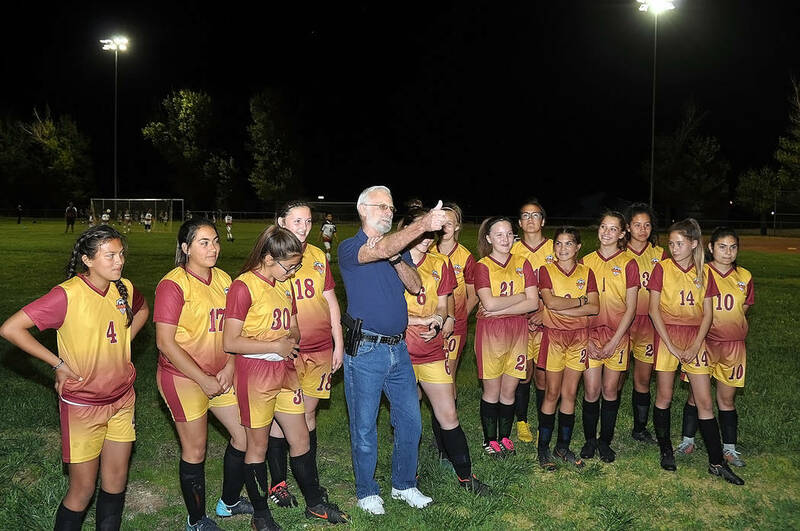 Horace Langford Jr./Pahrump Valley Times Nye County Commissioner John Koenig celebrates the new lights at Simkins Park with Pahrump Junior Trojans Soccer Club players on Monday night. Horace Langford Jr./Pahrump Valley Times New lights shine on Pahrump Junior Trojans Soccer Club practice Monday night at Simkins Park. Horace Langford Jr./Pahrump Valley Times Pahrump Junior Trojans Soccer Club players warm up Monday night under the new $1 million lights at Simkins Park. “They’re pretty cool,” was the reaction of 10-year-old Benjamin DeSantiago as he looked up at the new lights at Simkins Park. DeSantiago, who has been playing soccer since he was 3, was among a few dozen young players enjoying Pahrump’s newest lit athletic field Monday night, and it turns out that “pretty cool” might be an understatement when it comes to the lights. 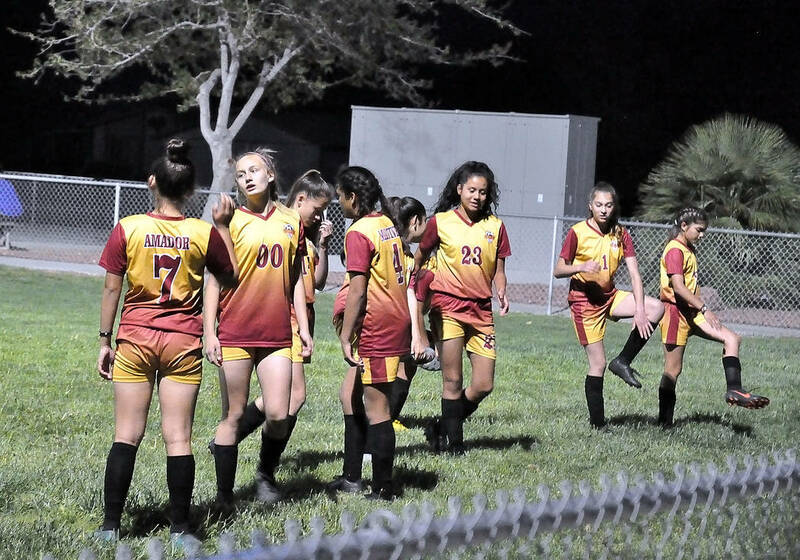 The high-efficiency lights, the same type that were unveiled last year on two fields at Ian Deutch Memorial Park, are also user-friendly, said Dusty Park, president of the Pahrump Junior Trojans Soccer Club. But the key thing for the soccer club and other young athletes is the town now has another park that can be used after dark. And with field space at a premium, the extra time is precious. According to Nye County Commissioner John Koenig, the park’s location is also important. “Simkins Park has been overlooked for quite a few years,” Koenig said. “The park has been here, but we haven’t really been paying attention. The prime focus has been toward the middle of town, the big parks that we have down there. I live up here, a lot of kids live up here, and we haven’t really done much with it. Also on hand to see the new lights was Nye County Sheriff Sharon Wehrly, who came away impressed. The need for more space was as obvious to the kids as it was to the adults. “I think they’re helpful, but we just need more in our community,” said Andrea Sauceda, 13, who has been playing soccer, mostly on defense, for nine years. Alexis Martinez, 12, has been playing for seven years and agreed with her fellow players. “They’re helpful, but it’s hard when you have so many kids wanting to play multiple sports,” Martinez said. Some of the other young soccer players understand that, as several of them also play other sports. Sauceda and Martinez run track, while Nelson plays softball, as does 10-year-old Emily Mendoza. Crotty said she also plays basketball, while Mendoza plays basketball and softball, but both have been playing soccer since age 4 as has Kohlzin Park, 10, who said soccer is his primary sport. “I don’t know if racing technically counts as a sport, but I used to do wrestling,” said Park, who races at Pahrump Valley Speedway. With so many players having years of soccer experience at a young age, the need for multiple places to play continues to grow. 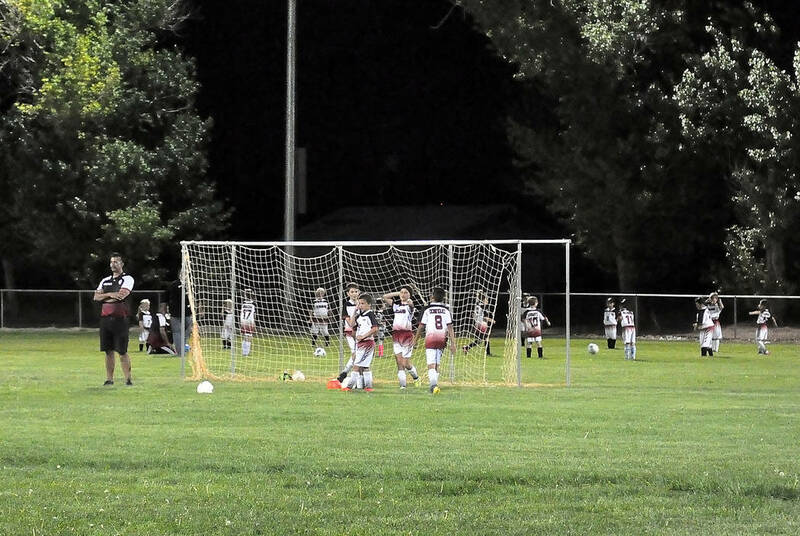 Everyone agreed that another park having athletic fields with lights is a big win, even before a goal is scored in a game or practice. The Pahrump Junior Trojans Soccer Club is always looking for new players to join its teams. The club includes teams from under 6 years old to under 19, and while it currently does not have a team in every age group, club president Dusty Park said that is its goal. Practices are held weeknights at Petrack Park Field C and Simkins Park. Interested players can contact Park at 775-253-1548. In addition, the club is always looking for qualified coaches and referees. Contact Park for more information.